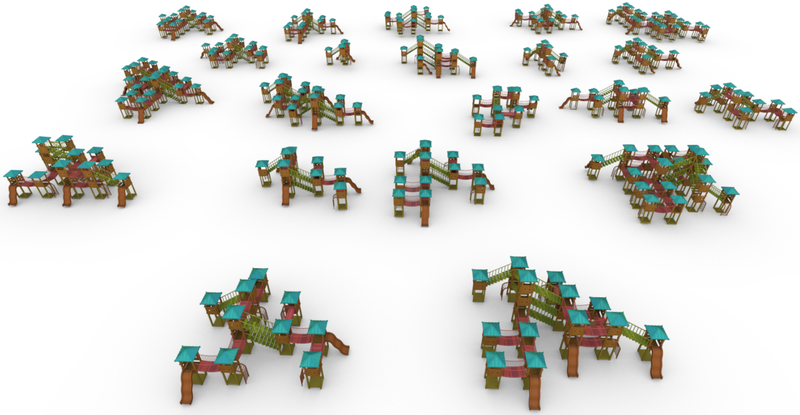 We propose a novel method to synthesize geometric models from a given class of context-aware structured shapes such as buildings and other man-made objects. Our central idea is to leverage powerful machine learning methods from the area of natural language processing for this task. 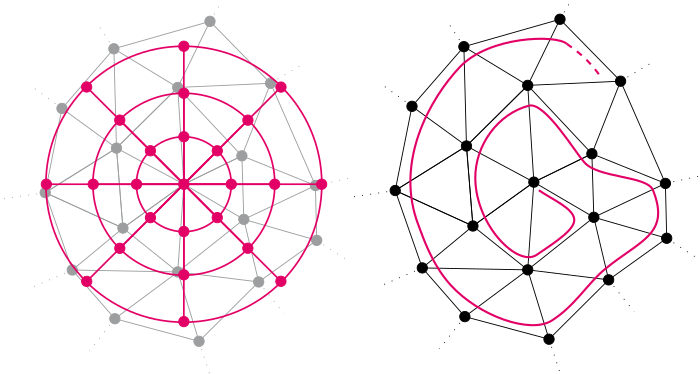 To this end, we propose a technique that maps shapes to strings and vice versa, through an intermediate shape graph representation. We then convert procedurally generated shape repositories into text databases that in turn can be used to train a variational autoencoder which enables higher level shape manipulation and synthesis like, e.g., interpolation and sampling via its continuous latent space. Feature curves on 3D shapes provide important hints about significant parts of the geometry and reveal their underlying structure. However, when we process real world data, automatically detected feature curves are affected by measurement uncertainty, missing data, and sampling resolution, leading to noisy, fragmented, and incomplete feature curve networks. These artifacts make further processing unreliable. In this paper we analyze the global co-occurrence information in noisy feature curve networks to fill in missing data and suppress weakly supported feature curves. For this we propose an unsupervised approach to find meaningful structure within the incomplete data by detecting multiple occurrences of feature curve configurations (co-occurrence analysis). We cluster and merge these into feature curve templates, which we leverage to identify strongly supported feature curve segments as well as to complete missing data in the feature curve network. In the presence of significant noise, previous approaches had to resort to user input, while our method performs fully automatic feature curve co-completion. Finding feature reoccurrences however, is challenging since naive feature curve comparison fails in this setting due to fragmentation and partial overlaps of curve segments. To tackle this problem we propose a robust method for partial curve matching. This provides us with the means to apply symmetry detection methods to identify co-occurring configurations. Finally, Bayesian model selection enables us to detect and group re-occurrences that describe the data well and with low redundancy. The question of representation of 3D geometry is of vital importance when it comes to leveraging the recent advances in the field of machine learning for geometry processing tasks. For common unstructured surface meshes state-of-the-art methods rely on patch-based or mapping-based techniques that introduce resampling operations in order to encode neighborhood information in a structured and regular manner. We investigate whether such resampling can be avoided, and propose a simple and direct encoding approach. It does not only increase processing efficiency due to its simplicity - its direct nature also avoids any loss in data fidelity. To evaluate the proposed method, we perform a number of experiments in the challenging domain of intrinsic, non-rigid shape correspondence estimation. In comparisons to current methods we observe that our approach is able to achieve highly competitive results. Feature curves on surface meshes are usually defined solely based on local shape properties such as dihedral angles and principal curvatures. From the application perspective, however, the meaningfulness of a network of feature curves also depends on a global scale parameter that takes the distance between feature curves into account, i.e., on a coarse scale, nearby feature curves should be merged or suppressed if the surface region between them is not representable at the given scale/resolution. In this paper, we propose a computational approach to the intuitive notion of scale conforming feature curve networks where the density of feature curves on the surface adapts to a global scale parameter. We present a constrained global optimization algorithm that computes scale conforming feature curve networks by eliminating curve segments that represent surface features, which are not compatible to the prescribed scale. To demonstrate the usefulness of our approach we apply isotropic and anisotropic remeshing schemes that take our feature curve networks as input. 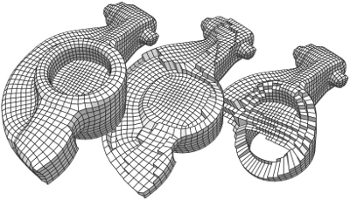 For a number of example meshes, we thus generate high quality shape approximations at various levels of detail. We present a method that expands on previous work in learning human perceived style similarity across objects with different structures and functionalities. Unlike previous approaches that tackle this problem with the help of hand-crafted geometric descriptors, we make use of recent advances in metric learning with neural networks (deep metric learning). This allows us to train the similarity metric on a shape collection directly, since any low- or high-level features needed to discriminate between different styles are identified by the neural network automatically. Furthermore, we avoid the issue of finding and comparing sub-elements of the shapes. 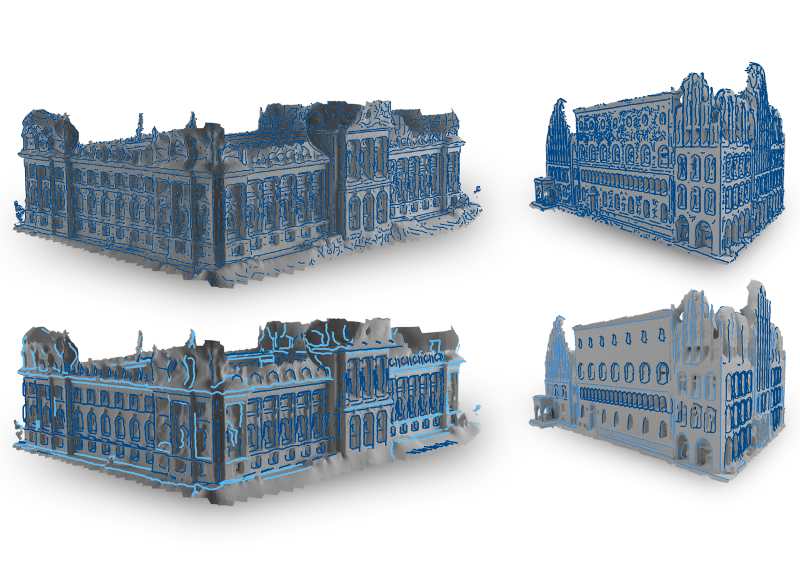 We represent the shapes as rendered images and show how image tuples can be selected, generated and used efficiently for deep metric learning. We also tackle the problem of training our neural networks on relatively small datasets and show that we achieve style classification accuracy competitive with the state of the art. Finally, to reduce annotation effort we propose a method to incorporate heterogeneous data sources by adding annotated photos found online in order to expand or supplant parts of our training data. 22nd International Meshing Roundtable, Orlando, Florida, USA. A purely topological approach for the generation of hexahedral meshes from quadrilateral surface meshes of genus zero has been proposed by M. Müller-Hannemann: in a first stage, the input surface mesh is reduced to a single hexahedron by successively eliminating loops from the dual graph of the quad mesh; in the second stage, the hexahedral mesh is constructed by extruding a layer of hexahedra for each dual loop from the first stage in reverse elimination order. In this paper, we introduce several techniques to extend the scope of target shapes of the approach and significantly improve the quality of the generated hexahedral meshes. While the original method can only handle "almost convex" objects and requires mesh surgery and remeshing in case of concave geometry, we propose a method to overcome this issue by introducing the notion of concave dual loops. Furthermore, we analyze and improve the heuristic to determine the elimination order for the dual loops such that the inordinate introduction of interior singular edges, i.e. edges of degree other than four in the hexahedral mesh, can be avoided in many cases.